A scathing new report gives Florida beaches a nearly flunking score! Environmental leaders are accusing the state of not doing enough to protect our sandy shores. PINELLAS COUNTY, Fla. — A scathing new report gives Florida beaches a nearly flunking score. Environmental leaders are accusing the state of not doing enough to protect our sandy shores. The Surfrider Foundation puts out an annual report card for the nation's beaches. 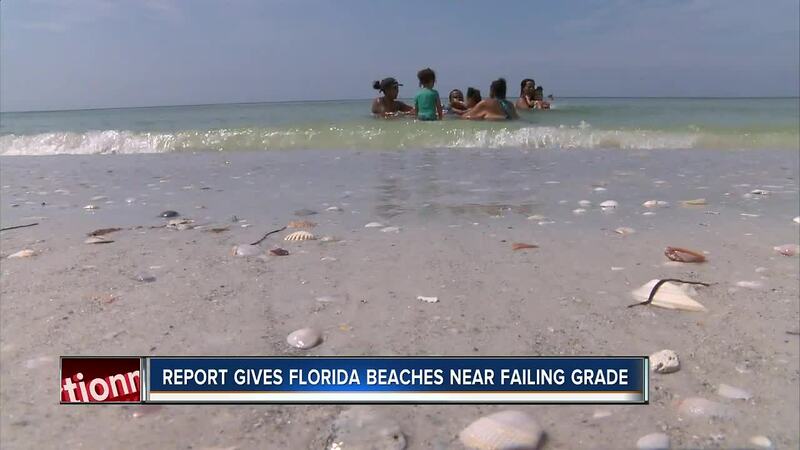 This year, Florida beaches received a "D" grade. Among the problems: Florida leaders allowing too much development near beaches, not planning for rising sea levels and relying too much on dumping more sand onto eroding beaches rather than finding long term solutions. Our state’s beaches draw more visitors than all the US theme parks and national parks combined, raking in $55 billion a year. So the new report from The Surfrider Foundation is eye-opening for some Tampa Bay business owners. “I’d say this year was probably a good eye-opener,” Michael Conlee, the owner of Urban Kai, explained. Conlee says his business took a big hit with red tide (despite the toxic bloom never actually reaching his business off the St. Pete Gandy Boulevard Causeway). He worries how water quality will impact his business and thousands like it that rely on tourism, in the future. Yet, Tampa Bay environmentalists are hopeful. Florida's new governor Ron DeSantis spent time Tuesday during his swear-in speech pinpointing the environment as one of his top priorities. “We will fight red tide. We will fight toxic blue green algae. We will fight discharges from Lake Okeechobee. We will fight for our beaches. We will fight to restore the Everglades and we won’t let the foot-draggers stand in our way,” DeSantis told the crowd. Conlee desperately hopes it’s a promise that's kept. “At the end of the day, water is life,” he explained. You can red the entire report here.